A new and updated Index Thread to try and help members find information on, and links to, the many various projects, quality assurance/improvements topics, and â€˜how-toâ€™ threads - that have originated on the OTâ€¢com down the years. If you see any broken links, errors, or projects in an incorrect category etc, please let us know. Also, if you have any suggestions for additional projects or threads to be added, please post them in here. Last Updated - 10th April, 2019. The XÃ˜ Project - Laserdisc on Steroids :. Arnie.dâ€™s . : The X9 Project :. Information on laserdisc players, the various Original Trilogy laserdisc releases themselves, technical info on capturing laserdisc content and general technical guides were all limited - and often it was the determination and efforts of members here - along with trials and errors, breakthroughs, failures and successes along the wayâ€¦ which resulted in many fan-made quality releases of the Original Trilogy on DVD (with choices of PAL or NTSC, letterbox or anamorphic widescreen, multiple audio tracks, interactive menus, commentaries, bonus content - and the occasional â€˜easter eggâ€™ - or just a â€˜straight-upâ€™ laserdisc capture transferred to DVD). Back then, few people had dvd writers, broadband internet, or hard drives large enough to store the films on, and there were very few file-hosting sites capable of storing such large files. Torrent sites were still in their infancy (and so slow)â€¦ so a Pay-It-Forward system, via postal services, was the usual means of distributing many fan-made Star Wars projects - all across the world. noneâ€™s :F:L:I:M:S:I:P:L:A:S:T: D:A:T:A:B:A:S:E: - a superb archive of many Star Wars releases. OmegaMattmanâ€™s Star Wars Trilogy: Hyperspace Collection - 720p AVCHD Project Complete and Now Available! - See Post 42 for final details! 7FNâ€™s 1983 UK â€˜TVSâ€™ Star Wars premiere - anybody still have a recording? retartedtedâ€™s "Droids Series Complete Set. (Reconstruction from multiple sources)." Bobson Dugnuttâ€™s Attack of the Clones - Centropy Theatrical Telesync "Remastered"
Zionâ€™s Backstroke of the West Project. poitaâ€™s Star Wars Documentaries on Film to be scanned - a 2018 project, scanning and restoring the 16mm SW documentaries â€˜From Star Wars to Jediâ€™, â€˜The Making of Star Warsâ€™ and Star Wars â€˜Classic Creaturesâ€™. .:. MoveAlongâ€™s The Story of Star Wars .:. Complete! samtheqâ€™s Announcing: "STAR WARS - the cutting room floor." noneâ€™s SW on TV - Idents, Bumpers, Commercials, Promos, Trailers, Station IDs, Adverts, Breaks, ??? spoRvâ€™s **Star Wars: deleted and extended scenes * database * ** - for the Original and Prequel Trilogy. Lord Grievousâ€™ Making Of Star Wars/Empire Strikes Back SPFX/Return Of The Jedi Classic Creatures laserdisc rips? as well as his quality non-Star Wars filmumentaries too. 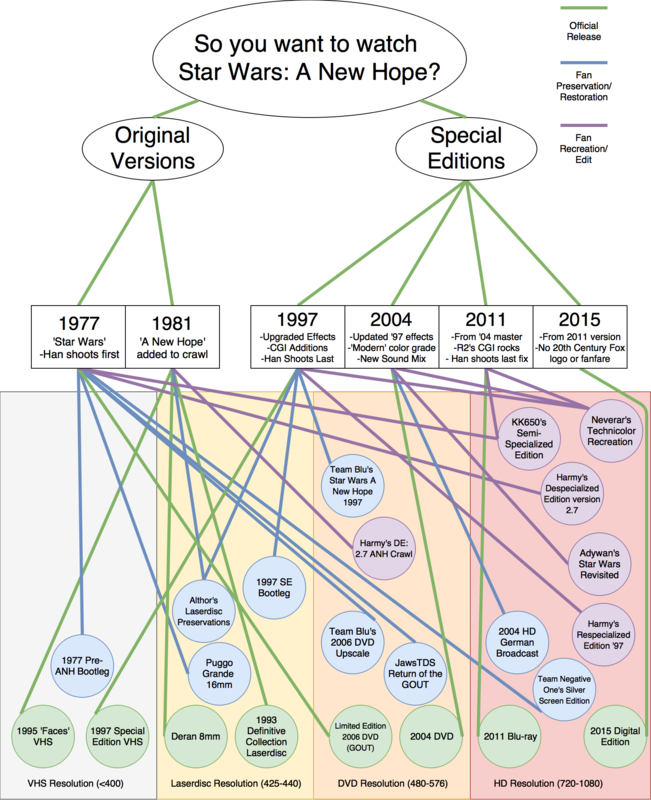 The â€˜An Index Thread for Star Wars Fan Editsâ€¦â€™ thread can be found in the â€˜Star Wars Fan Editsâ€™ section. Octoroxâ€™s Star Wars 77 six track mix with mono changes? fishmanleeâ€™s JOHN WILLIAMS: Star Wars Episode II: Attack of the Clones Expanded and Remastered Edition - V2 NOW AVAILABLE!! fishmanleeâ€™s JOHN WILLIAMS: Star Wars Episode VII: The Force Awakens (Complete Score Edit) (Some SFX) REVISED VERSION AVAILABLE! hairy_henâ€™s adding LFE to GOUT project. Rebelscumâ€™s 5.1 surround sound on Despecialized Editions? GroovyLordâ€™s The best audio, and differences between the many audio tracks available? russs15â€™s Star Wars films with audio description. Can anyone help out?? DrDreâ€™s Color matching and prediction: color correction tool v1.3 released! The thread is still open - so anyone can still also post in there. If you see any broken links, errors, or projects in an incorrect category etc, please let us know in this thread. Also, if you have any suggestions for projects or threads to be added, again, please post them in here. Although the bunny really wants to say hi. The new phone bookâ€™s here! The new phone bookâ€™s here! Absolutely mate - my apologies for missing them out. Our likely best hope of a professionally done restoration for a 4K theatrical version of the Original Trilogy probably lies here - with poitaâ€™s superb The Original Trilogy restored from 35mm prints ongoing project. That link is already in the index. What about the documentaries from 16mm. Edited by moderator to remove the whole lengthy re-quoted post. Why did you quote the entire thing?